Fishing… While there are lots of people who just catch and release, there are plenty who eat what they catch. 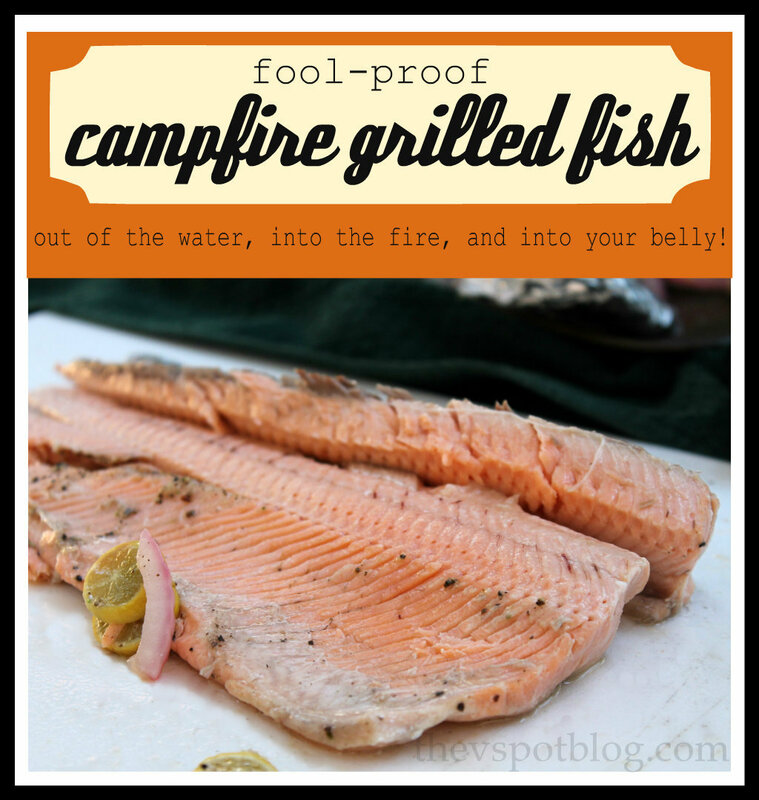 Here’s an easy way to cook up your personal catch of the day, pretty much right where you caught it. We had an awesome camping trip last week, and the fish…? They were biting. 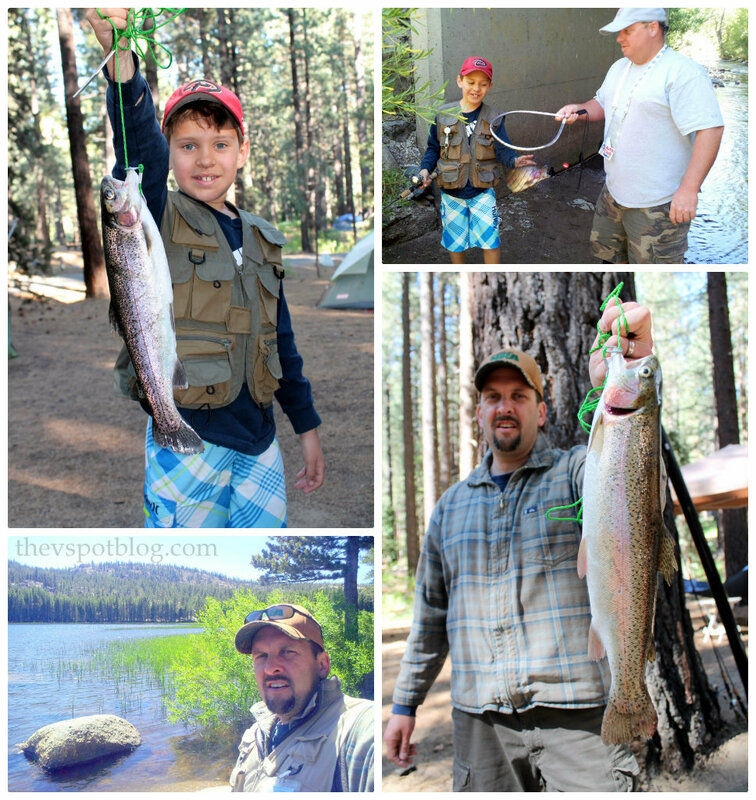 Grant caught several fish on this trip… a fisherman is born! These fish were beautiful Rainbow Trout, but this recipe would work well for just about any fish. Click HERE to learn more about our washing machine turned fire pit. Assuming you know how to clean and scale a fish (or that you have a handy helper to do it for you) this is super easy. Take your cleaned, scaled fish (with the head removed) and place it on a large piece of heavy duty foil. Sprinkle garlic salt and pepper on the inside of the fish. Thinly slice some onion and very thinly slice citrus and place them inside the cavity as well. Lemons work best, but limes are good too. You don’t want to add too much citrus or onion, because you don’t want those flavors to overpower the delicate flavor of your fish. Rub butter all over the outside and skin of the fish. While the fish is cooking, the butter softens the skin to the point that it will easily slide right off with a fork. 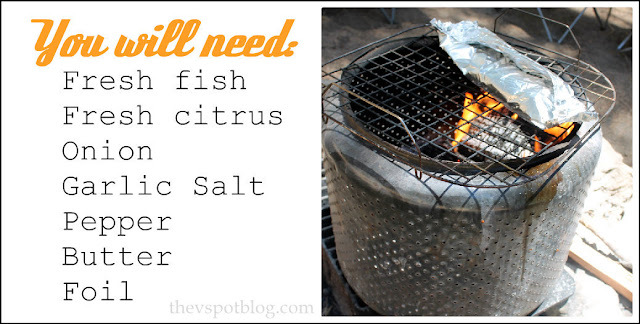 Make a pouch with the foil and place over coals or a low fire. Our trout (trouts?!) were about 2 pounds a piece and were done perfectly at about 7 to 8 minutes on each side. Bones can be kind of a problem, but here’s a super easy way to remove them. 1. 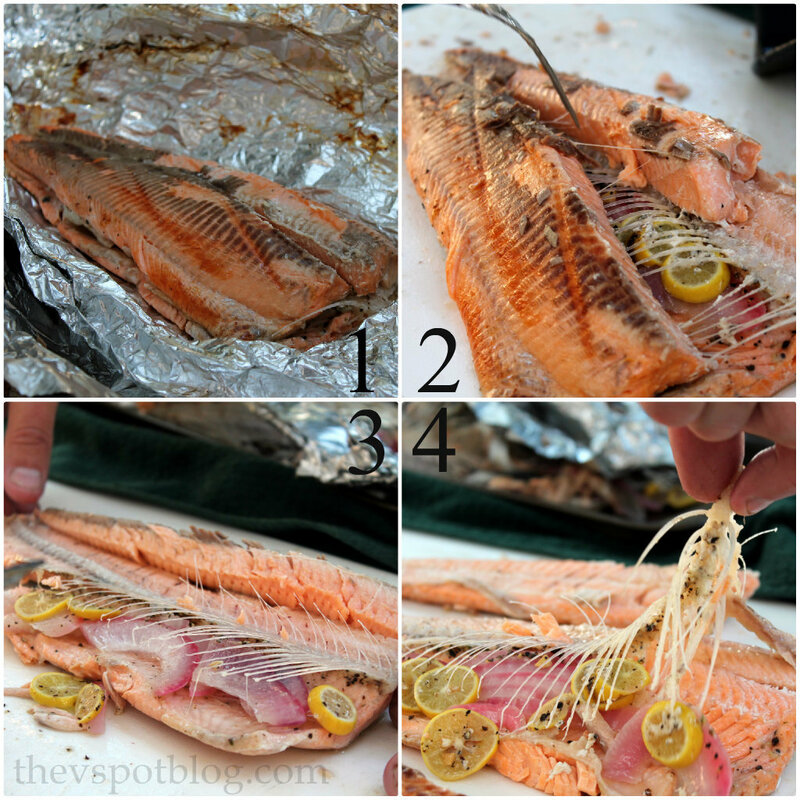 Open up the foil pouch and use a fork to pull the skin off of the fish. 2. Use a fork to pull the top filet in half at the seam. Slide one half off. 3. Slide the other half off. 4. Gently grasp the fish bones and pull up at an angle. They should peel right out. Now there may be a few little bones here and there, so keep an eye out for those, but the majority should be gone, so all you have to do is enjoy the delicious catch of the day! And remember: the worst day of fishing is better than the best day at the office! You can also cook the fish filet by laying it over a large flat rock which is sitting on the hot coal embers. The embers will heat the rock, thus cooking the fish. Great catch! Love doing the foil pack method when cooking on the grill! That fish looks delish! Pun intended. Pinned! place can be found at the heart of city and when the corporation receives a place there it helps to build its reputation among its audience. you will no worry the method that you will cover the house.